Watches, clocks, watch parts and clock parts falls under HSN code chapter 91 of GST commodity tariff schedule. The details about GST rate changes for sale of watches, clocks, watch parts, clock parts are being updated here. The notification changes on exemptions for GST for sale of watches, clocks, watch parts, clock parts and other circulars related to GST for Watches, clocks, watch parts and clock parts are updated in this website. 1. 9103 Clocks with watch movements, excluding clocks of heading 9104. 3. 9109 Clock movements, complete and assembled. 4. 9114 Other clock parts]. All goods not specified elsewhere. 11. 9114 Other watch parts]. 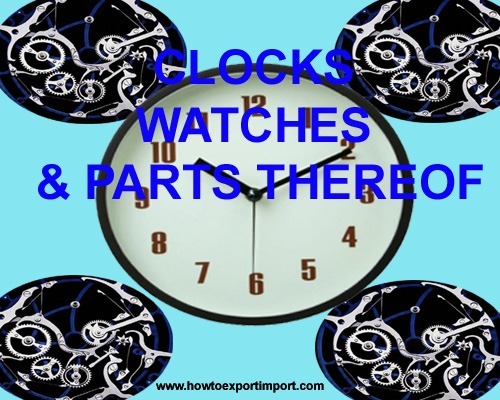 In Chapter 91,- (i) In the 28% rate column, the entry “9110 Complete clock movements, unassembled or partly assembled (movement sets); incomplete clock movements, assembled; rough clock movements” may be omitted; (ii) In the 18% rate column, the entry “5 - 9110 Complete clock movements, unassembled or partly assembled (movement sets); incomplete clock movements, assembled; rough clock movements” may be added In the 28% rate column, the entry from 9112 relating to clock i.e. “9112 Clock cases, and parts thereof” may be omitted; (iii) In the 28% rate column, the entry from 9112 relating to clock i.e. 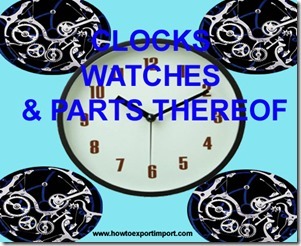 “6 - 9112 Clock cases, and parts thereof” may be added; [Clocks and their parts are at 18%]. Goods and Service Tax (GST) rate tariff in India is designed in 6 categories of goods and services. Four main GST rate slabs framed with Essential goods and services, Standard goods and services and luxury goods and services with 5%, 12%, 18% and 28% respectively. Commonly used Goods and Services at 5%, Standard Goods and Services fall under 1st slab at 12%, Standard Goods and Services fall under 2nd Slab at 18% and Special category of Goods and Services including luxury - 28%. The most essential goods and services attract nil rate of GST under Exempted Categories. Luxury goods and services and certain specific goods and services attract additional cess than 28% GST. GST payable for Wood, wood charcoal, wood articles etc. How much rate of GST for printed books, newspapers, pictures etc.? What is the GST rate on pocket-watches? How much GST on stop-watches? How to export from India to Nepal?